Having considered elsewhere what constitutes a Mews, it is worth considering why Mews came into general use in the Georgian and later the Victorian period (Georgian period was from 1714 – 1811). As part of this it also needs to be considered why they were built in unique settings, in a planned hierarchy which ensured they were separated from other dwellings and in effect deliberately out of sight and mind from the main houses. This planning principle underlies Georgian Town Planning which requires a separation of primary, secondary and tertiary accommodation. By creating an ordered grid of streets the Mews could be easily and discretely contained behind the houses. Thus the Mews as an integral part of Georgian estate building had evolved. On a typical square or crescent the Mews is both behind the main house, lower than it, and approached from a secondary road. They generally have their own entrances off the secondary road and were considered tertiary areas. 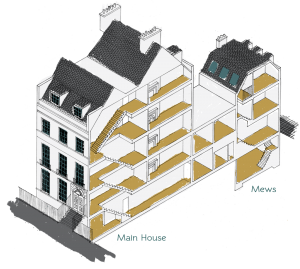 In an area such as Eaton Square the primary dwellings face the square, the shops and other secondary dwellings face the side streets such as Elizabeth Street or Ecclestone Street and the Mews such as Boscobel Place, Eaton Mews or Ebury Mews are hidden behind arches/entrances approached from the secondary roads. Georgian architecture was much influenced by a revival of classical styles. It was a period when taste and refinement were the watchwords. Therefore there were sound practical reasons for this separation. Given the then usage of the Mews, it could be considered a place too agricultural for the finery of the aristocracy. They were undoubtedly less than pleasantly fragrant due to the horses. During this period and before the social changes of the nineteenth and twentieth centuries the properties such as that shown in the above drawing would be occupied by a single family and staffed in such numbers as they could afford and demand. The Georgian period was marked by expansion in trade and in building. Building occurred across London and there was a particular concentration of this on the central London estates. It was here that the Georgian terrace houses flourished, whether in crescents, squares or streets. They were brick faced or stucco fronted, tall, narrow and deep. They were designed to be assembled by builders rather than sculpted by master craftsman. They were some of the first examples of industrial building techniques. Large scale construction was needed after the great fire destroyed the city in 1666. Inigo Jones led the way with attempts at town planning for the Earl of Bedford. He designed accomodation for society both rich and poor. What followed is what is regarded today as being the original garden squares. Each of the estates became subject to large scale building projects and soon expanded as a result. This was helped by the leasehold system, which allowed landowners to develop their estates in tandem with another developer/builder without the need for heavy investment themselves and with the advantage that they received income from ground rents up until the building reverted to them. The leasehold system allowed wealthy and influential families to both profit and extend their influence on the development of London without being unduly extended financially. Growth occurred across the estates in a systematic manner although there was little co-ordinated planning between estates. However, the wealth generated did become preserved by mergers by marriages between the power broking families of the day. The increased use of horse and carriages had demanded an architectural solution and the Mews were the natural progression from the private stables and livery yards that had previously been used. Mews were now intimately connected with the design of the Georgian town planning and the Georgian house.